The weird thing is, zie has started a new local business that offers life coaching, yoga, and reiki. The conjunction of evidence based medicine and reiki makes my brain melt. I just had one on my deck this morning. Unfortunately, I saw it only because I heard a thud and looked up, and there it was, perched on a deck chair, looking a bit dazed. I looked through my binoculars (yes, I have a pair handy where I sit, doesn't everybody? ), checked the bird book (yes, also handy right there), and made a pretty certain ID. But by the time I got my camera, it had flown off. I hope it's okay. I got the first strawberries of the summer at the farmers' market in town this morning. There's nothing quite like fresh strawberries. I ate a few already, and put the rest in to macerate for dessert after dinner. I went for another 30 miler today, and it was way better. I don't think I've gotten a bunch more fit in two days, though. I think I ate better today, and that makes a lot of difference. On Sunday, I didn't take any food, but ate a 100 calorie bag of sports beans. Today, I took a 250 calorie sports bar thing. I think I need to be a lot more thoughtful about eating on longer rides because it really does make a difference! On today's ride, I saw a snake in the middle of the road. It was maybe 2-3 feet long (it was curvy, and I didn't stop to look closely), and mostly brown. I'm guessing maybe a hogsnake? I started the process of filling out a grant form this morning. I signed onto the newish system. Then I tried to sign my collaborating student on. It seemed to work, except it would kick me back and the collaborator slot would be empty. So I tried again. And again. And then I called the grant office, and the very nice person there tried, and tried again, tried something else, and then said she's call the person who's paid to handle computer forms. I find grant forms pretty darned stressful anyway, but the newish ones are just horrible. We're using these newish ones because we're too cheap to pay the royalties to use the sort of forms we used to use. I wonder how much the difference in cost is, especially with pretty much every office having to set up new forms in some way and then troubleshoot them, and so on. Of course, the office that decided not to pay the royalties doesn't pay me, because I was working on my own time this morning. So they just don't care. Or maybe they're happy because they aren't paying and who cares about faculty summers. Anyway, this grant is due in a couple of weeks, but I wanted to get started because I'm lousy at grant writing sorts of stuff. I think this could be a very cool project, potentially useful, even. I did get an email back telling me that the form had been fixed. Now to write a narrative of the project. Oh, joy. Yesterday, I rode 25 miles, slowly, because these days I'm slow. Today, I rode 30 miles, also slowly. I feel those extra five miles a lot right now. It doesn't seem like I should, right? An extra 25 minutes or so? On the other hand, it's also an additional 20% over what I rode the previous day, so I guess that makes sense. And that's how things are around here. I'm reading and working on classes and a student's thesis. I'm gardening and weed whacking. I'm biking a bit. And I'm hanging out with friends, which is probably the very best part of summer. On my ride today, I saw a Sandhill Crane, a number of Eastern Kingbirds, and, I'm pretty sure, my first Ruffed Grouse. It was standing along the road on a curve, near some woods, and barely bothered to look at me when I rode by maybe five feet away. I've also taken a few photographs. I have a friend from college who takes fantastic photos. Then he uses photoshop on them to enhance colors and such. But often, they look unreal somehow. Not in the, hey, I made it black and white way, but in a really weird way. And then, of course, I wanted to try some of that. So I did. 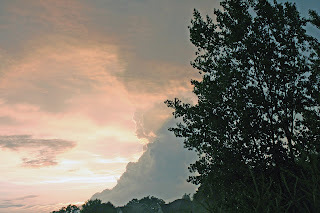 Here are some pictures after a storm passed the other day. Unretouched. I was trying to get at the way the sun comes through, near the upper right. And this one is made black and white. So, the move to black and white seems fine. 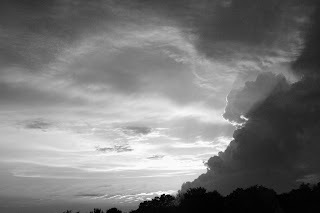 The sky was really orangy, as it is at sunset sometimes, and the black and white makes it a bit dramatic, but not weird. But the other one looks too, I don't know. It's interesting how it picked up the contrast so that you can see through the tree a lot more clearly than you can in the original. But the sky looks way more pink than it did. The cloud looks way less ominous and dark than it really was. I don't know why, but I'm feeling stress about my classes this coming semester. And now I'm here to ask you, the internet knowledge base, for some more help. I'm looking for some theories of comedy, old comedy, new comedy. And readings on theories of comedy. I have some few ideas. I'm going to look at Freud, and some Bakhtin (on carnivalesque). But I'm sure you wonderful folks can help me learn more. Please! In other news, I turned in my book order for my final class yesterday, the one Flavia has been so helpful about. And in doing so, found out that two of the books I'm planning to use have new editions that I don't have yet. So now I'm waiting on new desk copies to work on that class. I think I should make a list and check it twice. I'm feeling sort of overwhelmed, and like everything I want to do is do-able, but will take a lot of time, so I sort of don't know where to start. Let's get started with some cuteness. So cute. They said they separate the calves from the cows within a few days, which seems sort of lonely. And then they're in these little pens for a couple of weeks to make sure they're healthy and don't share any germs. Then they're put in age-group pens. Breakfast for the cows, too. The yellow thing on her nose prevents her from trying to suckle other cows; the dairy guy said that there are a few who try, and they put the plastic thing on to prevent that. Who knew? This is a strange looking cow, no? This dairy breakfast featured pancakes. They were good, but just not nearly as good as the Belgian waffles. The question of the day: can I find another dairy breakfast for next week? I've been reading a text to think about whether to order it or a different one for our gateway to the major class. I'm finding it interesting, and thinking of going with this text rather than the other one. About 100 pages in last night, I saw the first of a few chapters where someone has made marginal comments and notes. The comments are all in my handwriting (which is pretty distinctive). And yet I have no memory of having read this book previously, nor is it bent in ways that would indicate it's been read. I'm guessing I read a few chapters for some reason. Weird. So it feels like the first day of summer. I went to a local dairy breakfast, where I had very good custard and strawberries over cornflakes. Two friends came, and then afterwards we sat on my deck and chatted a bit. I still have a ton of stuffs to do, just in the usual way, but I think a nap may be in order, as a special summer celebration. Happy summer, blogosphere! Background: I'm being paid for attending this workshop and the "pay" included lunch each day, the idea being that we'd all hang out and talk about the workshop stuff. That's pretty much happened. I was disappointed to learn today that the workshop head has given a book publisher (the one publishing the book we'll be required to use) the opportunity to talk to us over lunch that the publisher will provide. For the cost of that lunch (bought through the campus suppliers by the workshop funders), the time of all the learners in the workshop has been given to the publisher. The publisher is taking on the cost of providing lunch (I'm assuming not from the campus suppliers, but who knows), and will have access to us to try to sell us stuff. So basically, my time has been sold. And I suspect it's been sold pretty darned cheaply. I suspect that I will take my own lunch and eat elsewhere. That may piss off the workshop head, but that's life. I objected to the arrangement when I found out about it, as this is a particularly vile publisher, and was brushed off. Not only was I brushed off, I was sort of mocked by one of the organizing folks because this is a common practice and how dare I question it. I'm going to ask tomorrow how much the campus suppliers charge for lunch per person, because then I'll know how much the workshop leaders think my time is worth. Any guesses? Am I crazy for objecting? I mean, this is a particularly vile publisher, no, not that one, but the other vile publisher. And I know that there's been tons of research on the free pen stuff for medical folks which demonstrated that medical folks changed their prescribing behaviors when they got free pens (or whatever) from pharmaceutical companies. I'm pretty sure no business is spending money on advertising type stuffs if they aren't thinking it will be worth it in terms of increased sales. And finally, isn't it a bit amusing that a workshop on rhetoric that uses marketing terms is arranged by people who are seemingly unaware of how marketing works? Here's what I always wonder about workshops that are supposed to develop instructors as better teachers: why are they so often poorly done in terms of time management and structuring? We sat today for two and a half hours solid. No moving around. There was one short five minute starting point where we made individual lists and shared. But other than that, it's mostly been being talked at or shown stuffs on a screen. We're discussing rhetoric, and talking about intentionality and such. (We're looking at James A. Herrick's "An Overview of Rhetoric.") The speaker is insisting that something that isn't purposeful isn't "rhetoric." The example was a lazy email from a student, the "hey, did I miss anything in class yesterday?" sort of email. But it's still a text, and I'm not sure it's not rhetoric, since it's communicative. I'm having trouble resolving the focus on purposeful and intentional "rhetors" and my literary training in reading and thinking about what might not be intentionally done by an author, but is still there. Let me give a simple example: X tells a joke. Y reads the joke as racist, and calls X on it. X says it wasn't the intention. Now X might not have been highly aware of the intention, but the joke may well be racist. And there may be a sort of unacknowledged intention of trying to get Y (or other audience folks) to accept and adopt the racist point of view, no? As a lit person, I step back from intentionality, and look for effects and multiple meanings. That doesn't mean that I don't recognize that people do have intentions and try to achieve those, but that I don't think I can always know those intentions (nor do I think people are always deeply aware of their intentions) and that I think people can express really important stuff without intending to. The way lit folks read tends to look at authors as cultural products and producers; the way we (here in this room) read tends to look as rhetors as highly individualized, independent, and not as products, but only producers. Both my second workshop of the summer, and the second time I've done this workshop. I did it last summer, in preparation for teaching our new composition course. If you remember (or look back to) last August, I was pretty frustrated by the workshop last time and more frustrated by teaching the course in the fall. It got a lot better in the spring. It's interesting to see the workshop a second time, when I'm not at all stressed about it. It's easy to see that other folks are stressed, though. Last summer, I decided to go with the research and restrain my responses to proofreading sorts of issues in student papers. And I did. And it was really good. I did, on a few occasions, talk to students about grammar issues. For example, I had one student who was a really good writer, doing all sorts of neat stuff, but who made this one type of mistake. So I talked to her about it, and voila, she was happy to know and didn't make the mistake again that I noticed. She was just ready to learn that. There were a few really resistant folks, totally understandably resistant. We tend to think that doing something is always better than doing nothing. The big thing was that it was less stressful for me. That's huge. If it's June, it Must be Dairy Month! It's dairy month, and that means Belgian waffles, maple syrup, and whipped cream. Yes, that's my breakfast. It was good. It was very good. And these are cheese curds, some of the best I've ever had. They were piping hot, melty, and very lightly breaded, and they were oh so good! On the left is cotton seed, then ground corn, and ground soy (if I'm recalling correctly). They had a really interesting display of cow food. On the left is corn silage, the right is hay silage. On the left is cotton seed, then ground corn, and ground soy (if I'm recalling correctly). The amounts are (the explainer said) about what one cow eats per day. Pounds and pounds of this! I'm back in the land of the northwoods! I had a good trip, and an especially good time seeing my old college pals and some family. But now I feel derailed (which had worried me when I left). I need to get back on track to finish this paper. And then I'm teaching new classes this fall (one isn't new, but I haven't taught it since 2004, so it's feeling pretty new), so I have a ton of reading to do. I've ordered books for two of the three classes, but not the third. I need to read some more to decide, and then order those books. Then I need to start reading for prep for real. It's evidently been raining a lot in the upper Midwest, which means my yard is growing lots. That's great! It also means the weeds are growing even faster, which maybe isn't so great. So You Got a TT Job, Now What? If you haven't already, finish your dissertation or thesis. Even if you can't defend over the summer, finish. It did it's job, which was to get you the job, so be done if you possibly can. Pro tip: If you're like me (and a lot of other people I've talked to), you got to the end of high school and figured you'd learned how to work hard, and then you got to college and realized that you hadn't known what work was. And at the end of college, you figured you'd learned how to work hard, and then started grad school and realized you hadn't known what work was. Becoming an assistant professor seems to feel like that all over again for most people I talk to. It did for me, too. Know it's coming. Having a dissertation to finish on top of everything else is way harder. Find a place to live that will be as relatively worry-free as you can. Your home is likely going to be a refuge of sorts. Contact the IT folks at your school, and find out what sort of course software they use, and also see if you can get access to it a bit early. If you can learn at least the basics before you get to campus, that's often helpful. Or maybe you'll find out that you already know it, and that's one less thing to worry about. I didn't know when I started that a lot of departments keep past syllabi and such around. In my department, the admin assistants have access to a file for every course. At the minimum (which is sometimes the case), it has the original course paperwork, which outlines what the course is supposed to do and at what level. Sometimes it has other information, too. Pro tip: A good administrative assistant is a thing of wonder. Get to know and cherish the people who run things from behind departmental desks and other places. The Library. Librarians make the world go around; find out if you should make classroom visits for some of your classes. The IT Center. Whatever it's called, those people are responsible for making computer stuffs work. Tutoring Center. Whatever it's called, find out what they can do to help your students. Research Support. Again, called different things, but invaluable! Teaching Support. Take advantage of what these folks have to offer, at least a little. One of your jobs as a new faculty member is to get ready for the tenure decision. Don't obsess as a first year faculty member, but it's part of your job, so do it. During these first two weeks, departments at my school are supposed to hold meetings for tenure track folks to give them basic information. This may be led by the chair or by someone from whatever tenuring committee there is. These meetings are really important. Done well, they're invaluable. But try not to panic even if it's not super helpful. In my department, we have a tenure plan document which lays out in pretty specific ways what we consider in making reappointment and tenure decisions. We give each new faculty member a copy, and go over the relevant parts. We also explain our review process. Some schools will be more, some less explicit about this stuff. If you can get fairly explicit information, then take it seriously. It's worse, usually, if you can't get explicit information. In that case, you can ask other people who've gone through the process recently to see what they did and ask how it went. This is WAY harder at smaller schools where fewer people go through the process. It's also way harder at schools where TT faculty don't really expect to get tenure. At any rate, you still need to be aware that there are criteria (more or less explicit) for gaining tenure, and that you need to figure them out and meet or exceed them to get tenure. The good news is that you don't have to do that all in one year. At my school, we pretty much figure that the first year is for teaching and research, and give folks a pass on service stuff as much as we can. In the second year, we add in service and advising. I was part of a departmental review team this past year for a small department, and we felt that their tenure/review process wasn't clear enough, and recommended some changes. So I know that at my own school, while I feel my department's processes are pretty clear, it's not true in every department. One of the scary things was that the TT faculty all seemed to have different ideas about what was required for tenure, and didn't seem to realize how different their ideas were until our team asked them in a group meeting. My concern is that if the department or school is small, and has traditionally tenured straight white men, and you're not a straight white man, then you may need to figure out the hidden rules to get tenure. It's not necessarily that the department is hiring people thinking that it's going to use them up and spit them out, but that even a department of folks who try to be decent can unwittingly make things a lot more difficult for people not like them. Pro tip: Make yourself a physical file folder or two. Put your updated CV in there, copies of your syllabi and course assignments. Any time you get a note from a student thanking you for whatever, put a copy in there. When you get any sort of review stuff, put a copy in there. These files will give you the beginnings of your review portfolio and will help you remember all the stuff you need to add to your CV and such. This sort of thing is on my mind a lot right now because I'll be chairing our department tenure/review committee this year, and I really want to do a good job. So I have a request, too: If you have ideas about what would have helped you succeed as a new faculty member, or what you've seen tenure/review committees do that was absolutely superb (or was horrid), then I'd like to ask for your input and learn from you. Edited to add: I see to do this every few years. Here's what I had to say way back when (2006). I thought I'd give one last thought to our job searches last year. And then I thought that I should make a list of those posts. Dec 12: Job Search: Practice! I hope the posts are useful a bit to folks preparing to go on the market or on the market. For folks who got jobs, there's a lot to do to get ready for a new beginning. For those who are going on the market again, there's the job of getting ready again, updating, revising, and such. And for those who've decided to do something else, then there's a lot to do there, too. And then there are those of us who are continuing along in whatever we're doing. And still, there's a lot to do. A final note: the searches I was involved in have all either made hires or declared themselves failed. Some of those may be reauthorized next year. Of the hires I was more involved in, I'm really pleased with the new folks who will be joining us. They're going to be superb additions to our community, and I look forward to working with them and learning from them. I'll be heading back to another teaching writing workshop week after next, and meanwhile, there's the Criterium du Dauphine to look forward to!